Price action in the futures markets has affected the industry-wide performance of commodity trading advisors (CTAs) since 2008. 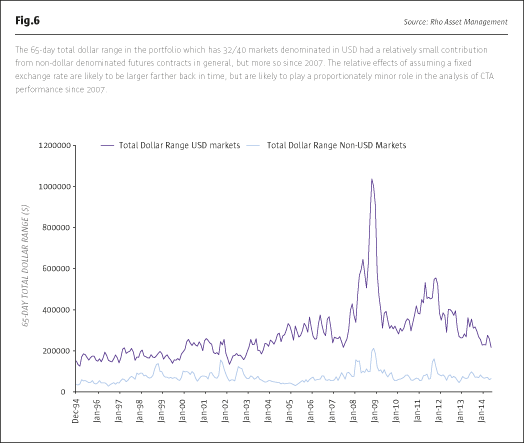 The events surrounding the Lehman bankruptcy in September 2008 led to an unprecedented expansion of the trading ranges in virtually all futures markets – an unusual event, in that the trading ranges expanded simultaneously across the portfolio. It is no coincidence that 2008 was the last year with double-digit returns on industry benchmarks like the Barclay Top-50 Index (BTOP50). Since then, there have been three calendar years with negative returns from the BTOP50, and performance has been below long-term trends. We study the effect of price range compression on returns, and show that price range compression since 2008, after the enormous range expansion that year, can explain recent CTA returns. During a profitable trend, prices must move from one equilibrium level to another, covering a significant price range over the reference time period. Using daily data, significant trends generally last from three months to three years, and make a succession of new highs or lows along the way, resulting in an expanded price range (see Fig.1). Here we use the Australian dollar contract to show a successful break-out leading to a short trade. The price range near the end of the trend (red arrow on the right) was greater than at the beginning of the break-out. Thus, range expansion occurs during major trends. Rarely, markets can remain trapped in a broad range, so even though new highs or new lows are infrequent, the range is sufficiently broad to allow profitable trading, so that trend-following can be profitable for short periods, even though the trading range does not expand, or expands only marginally. In contrast, trend-following is generally unprofitable (using daily data) if the price range is shrinking, since there are numerous changes in direction, whether one uses break-out style or moving-average systems, and each change in direction is only slightly profitable or actually loses money. Of particular interest is the distance traversed during the trend. We can calibrate the distance covered by mega-trends using daily data and daily standard deviation over 20 days of data, which approximates about one month of calendar time. Mega-trends can travel a distance of 20 to 60 times the 20-day standard deviation. For example, the crude oil decline shown in Fig.2 using weekly data covered a range of about 34 times the 20-day daily standard deviation at the peak in prices. Such giant trends are the stuff that trend-following dreams are made of, and are usually followed by prolonged contractions. One unusual feature of the years 2009-2014 was the active role played by central banks, which disrupted the usual pattern of consolidation (following range expansion) in the equity and bond markets. We focus on the CTA performance since 2007, and show that the range contraction since 2008 is the key to understanding the weak performance of trend-following strategies over the last few years. The crude oil market captures the events of 2008 and beyond better than perhaps any other market in a futures portfolio. Observe the enormous price expansion from, say, the second quarter of 2008 into the first quarter of 2009. This market then flattened out, and has traded in a narrowing six-month range since then, so now it is less than 10% of the maximum range in 2008. Most futures markets show the 2008-2009 price expansion, though the subsequent price ranges, from the second quarter of 2009 through the second quarter of 2014, have varied from the crude oil pattern. 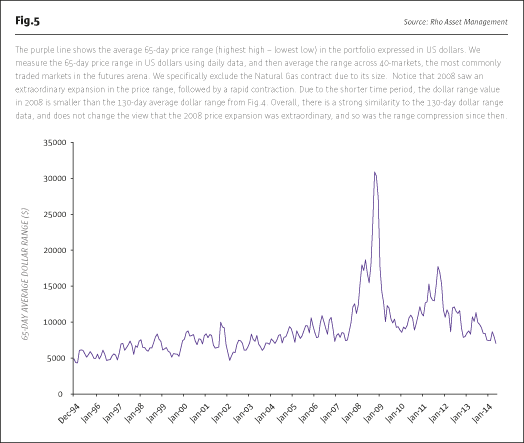 Some have recovered to make higher price highs than the 2008 peaks (see Australian dollar, Fig.3). The recovery has been driven by central bank interventions to support the faltering banking systems. In order to understand recent CTA performance, we need to recognize that the range expansion during 2008-2009 was extraordinary, if one examines most common futures market portfolios. We use a portfolio of 40 commonly traded futures markets, but specifically exclude the natural gas contract because its size specification is significantly larger than other contracts and thus tends to distort the analysis. We used the 130-day price range (highest high – lowest low) expressed in US dollars as the metric of choice for measuring the price action in each market. The 130-day horizon is approximately six months of calendar time, and thus ignores one to five-month fluctuations in the markets. In order to simplify the calculations, back-adjusted continuous contract data were used, and the foreign-exchange conversion rates were constant. Since the 130-day price range was averaged across the 40 markets, and since most of the markets used were denominated in US dollars, the effect of assuming constant exchange rates was considered to be acceptable for the purpose of our analysis. We show in Fig.4 that the range expansion in 2008 was rapid, and the highest value recorded at least since 1995, and was followed by an equally swift shrinkage in the 130-day range. 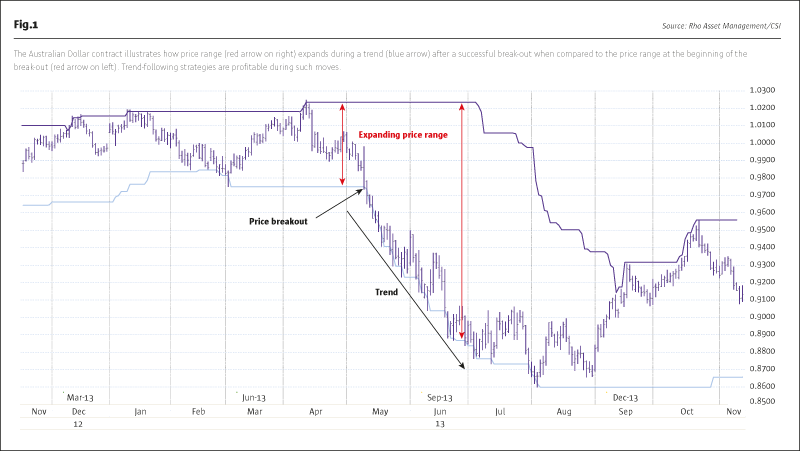 After a rebound on into 2011, the range has been compressing for the last two years. If we use our earlier discussion of range expansion during major trends, one can infer that 2008 should have seen strong returns for trend-followers, followed by weaker returns over the past few years. A key question is whether the choice of the six-month or 130-day time period affected the measured dollar range picture since 2008. We test this idea by dividing the reference period in half, using a 65-day time interval or approximately three calendar months, to determine the average dollar range in the portfolio (see Fig.5). Overall, there is a strong similarity to the data in Fig.4, and shortening the time period does not alter the view that the price expansion in 2008 was extraordinary, and was then followed by a significant and persistent compression in the trading range across the portfolio. We use the more sensitive 65-day dollar range to add some colour to the dollar range evolution in the portfolio. First, we show the relative amounts of the total dollar range, as opposed to the average dollar range, from markets denominated in US dollars (32 total) and those not denominated in US dollars (eight total) to show that the contribution from non-USD-denominated markets is relatively small in recent years (see Fig.6). 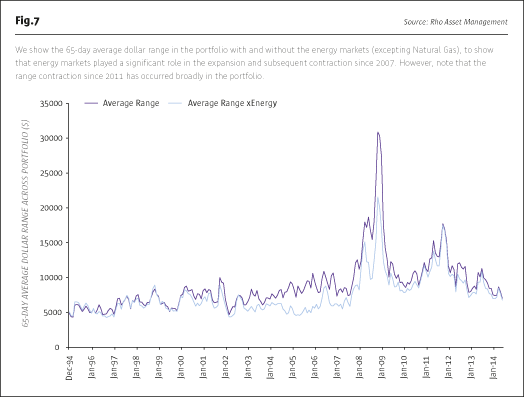 Second, we show the contribution from the energy markets, by showing the average dollar range in the portfolio with and without energy markets (excepting the natural gas futures contract). We saw in Fig.2 that the energy markets had a significant contraction in 2008-2009, and that may have been in the expectation that world-wide economic contraction would reduce energy consumption. We show in Fig.7 that the pattern of average dollar range expansion and contraction in the portfolio does not change even without including the energy markets, even though the energy markets made a major contribution to range expansion and contraction. We summarize the basic connection between range expansion or contraction and returns as follows: during major trends, there is an expansion in the average dollar range across the portfolio, and trend-following strategies, such as break-out-style systems are profitable. During long-lasting trendless periods, the trading range shrinks and trend-following strategies are unprofitable. A middle ground also exists, because there can also be false break-out events, in which the trading range first expands, but the prices reverse, so that the trend-following strategies are unprofitable. We focus on the time period from December, 2006 to May, 2014, which is roughly the last seven and a half years. This period includes the years before and leading into the Lehman crash, and all the years since. The question we seek to answer is whether there is a connection between the observed average dollar range and actual returns. We begin by using simulated gross returns of a 130-day simple channel break-out system, without interest or fees, and compare 12-month returns to the 12-month rate of change in the six-month average dollar range. We examine the 12-month gross simulated return for the 130-day simple channel break-out system on a 40-market portfolio. We then compare it to the 12-month rate of change (ROC) of the 130-day (six-month) average dollar range across the portfolio (Fig.8). Our hypothesis is that when the 12-month ROC is expanding, returns should be expanding, and vice versa. Using a 12-month return period allows us to smooth out the fluctuations in the return and thus focus on the bigger picture. 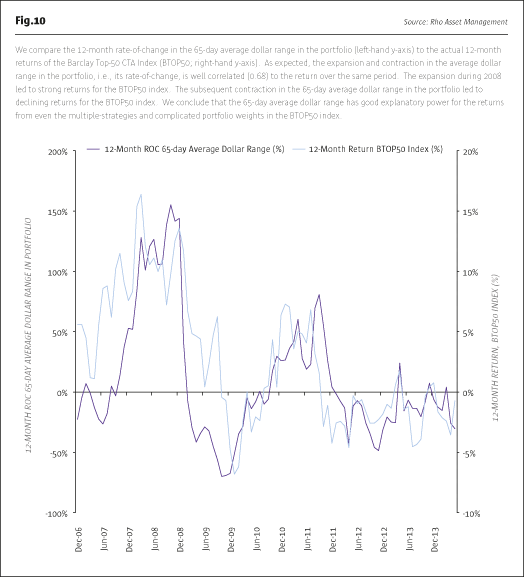 In Fig.8 we see that there is a good connection between 12-month ROC of the average dollar range in the portfolio and the absolute performance of a simple break-out strategy applied to the portfolio. The gross simulation does not include interest or fees, and thus isolates the results of applying simple trading rules to see whether an expansion in the trading range observed in the portfolio correlates well to absolute returns. We find that the correlation since December 2006 was 0.62, and the independent variable (12-month ROC of six-month average dollar range, left-hand Y-axis) explains the 12-month gross simulated returns (right-hand Y-axis) quite well. Note how the lack of trends since 2011 is visible in the negative 12-month ROC of the six-month average daily range. In 2009, there were price reversals without appreciable changes in the six-month trading ranges, and hence we have a divergence. Since late 2010, the correlation has been about 0.78, showing an even stronger connection between the declining dollar range and break-out system performance. 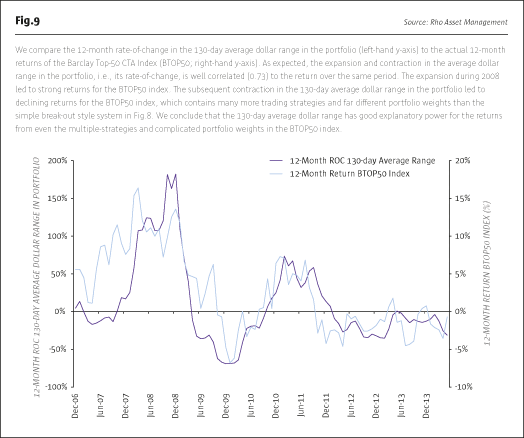 We now ask the question whether this logic can be extended to the real world, away from simple simulations, and to this end we examine the 12-month returns of the Barclay TOP50 CTA index performance and the same 12-month ROC of six-month average dollar range data used above (see Fig.9). Just as in Fig.8 with a simple break-out-style system, we see thatthe 12-month ROC of the six-month average dollar range of a 40-market portfolio can explain the absolute performance of the BTOP50 index, which shows the performance of many complex strategies and sophisticated portfolio-weighting algorithms. 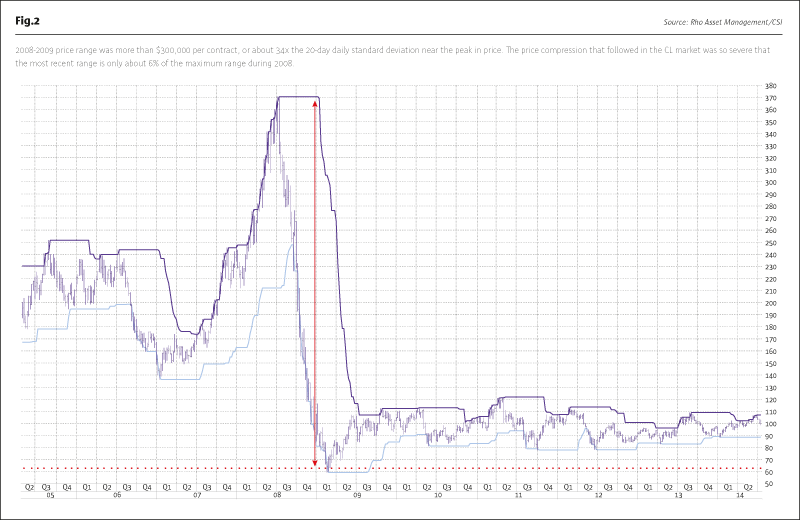 The correlation is quite compelling at 0.73 since December 2006. 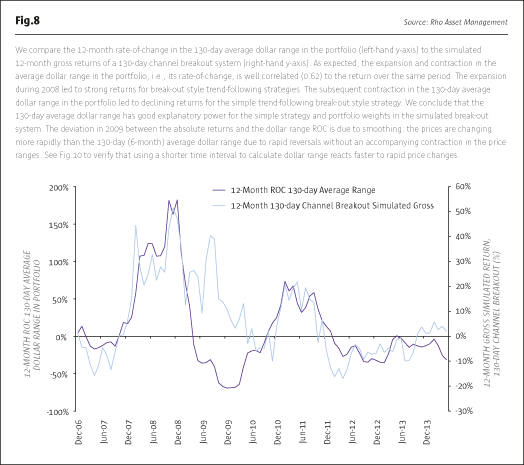 In Fig.8 and Fig.9 we can explain the simulated performance of break-out-style systems and the performance of even the many complex strategies in the BTOP50 index by simply examining the rate of change over the same period of the six-month average dollar range. Thus, there is a good connection between expanding trading range and positive returns, and contracting trading range and declining returns. We test the value of using the 65-day average dollar range in trying to explain BTOP50 returns (see Fig.10), and find that halving the range calculation period retains good explanatory power for BTOP50 returns since December 2006. Clearly, the weak performance of CTAs since 2008 is related to the declining range of price action at the portfolio level, measured across 40 markets, without being overly sensitive to the length of time used to calculate the average dollar range. Now we note that the average dollar price range is an arbitrary, but quantitative, measurement of price action in the portfolio, and can be calculated independently from daily closing prices, without reference to actual returns for each day. Thus, we can characterize the trading environment in a consistent, objective manner, and evaluate the overall favourability of the trading environment. 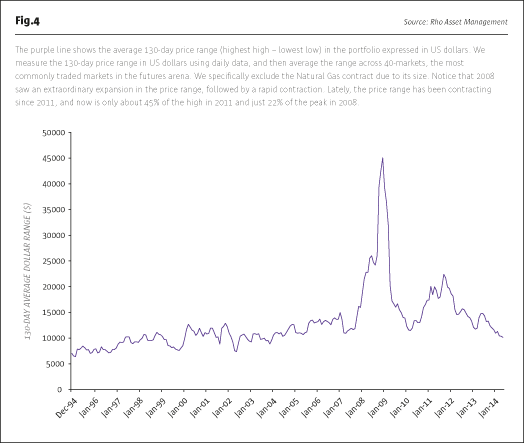 We can cross-check the hypothesis that price range compression explains CTA performance over the last few years. If the price range is declining, then this suggests that the standard deviation of daily closing prices should also be declining over the same period. 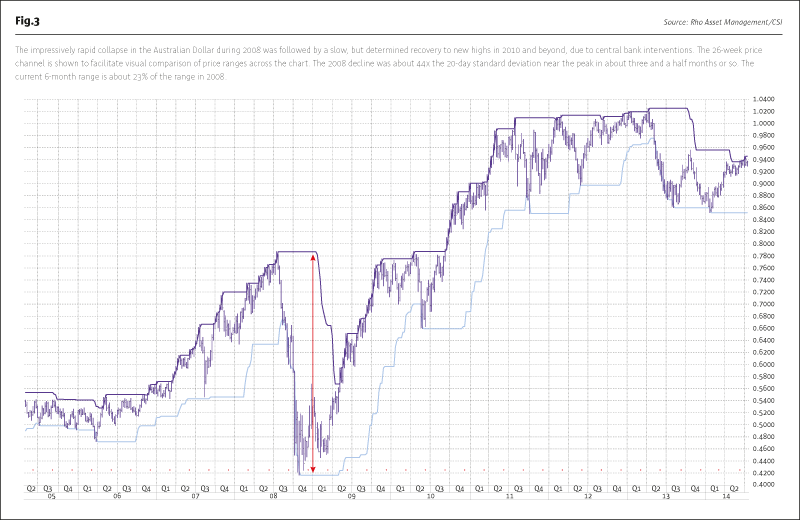 We should then be able to use the standard deviation in much the same way as we are using average dollar range. Hence, we repeat the process by calculating the 130-day standard deviation across a 40-market portfolio, converting into a common currency, to US dollars, and then averaging the values across the entire portfolio. 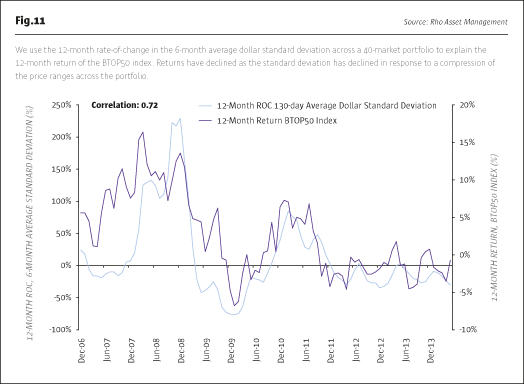 The relationship between recent 12-month BTOP50 returns and the 12-month rate of change of the six-month average dollar deviation is shown in Fig.11. Recent CTA performance can be explained by a compression in the price range across a broadly diversified portfolio of futures markets. There was an extraordinary expansion in the price ranges in these markets during the events surrounding the Lehman bankruptcy in 2008. Since then, trading ranges have contracted, and the performance of diversified CTAs has been lacklustre. We measured price range as the 130-day (six-month) or 65-day (three-month) price range in US dollars averaged across a 40-market portfolio, and showed that the 12-month returns in the BTOP50 benchmark, and 12-month simulated returns for a simple 130-day break-out system, are closely related to the 12-month rate of change in the portfolio average dollar range. 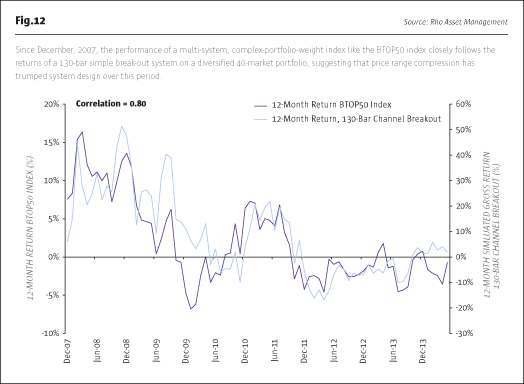 Since an expansion or contraction in the trading range can also be measured by changes in the standard deviation in prices, we confirmed that the 12-month rate of change in the 130-day average dollar standard deviation across the portfolio is closely correlated to the 12-month returns of the BTOP50 index. Thus, we conclude that recent CTA performance (see Fig.12) can be explained by price range compression in the futures markets.